My water bottle goes almost everywhere I go. I’ve had the same Hydro Flask for several years now. The days I’ve forgotten it or misplaced it are rough- I imagine I feel much like a child feels about his/her special blanket. I need it with me always 🙂 I also need to clean it more often– OOPS! HOW OFTEN SHOULD WATER BOTTLES BE CLEANED? Drinking water throughout the day is important for good health. Keeping a reusable container at your side is a great way to increase your water intake while also protecting the environment. But…. When was the last time you cleaned it? Like most of us we might wait days, weeks, or even months to clean it out. Turns out….. We should be washing out our water bottles every single day! This was news to me and will take some time to master. 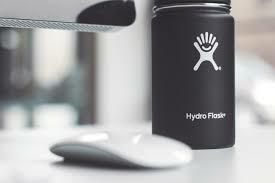 Can I blame the nasty cold that has been in our household on our 5 dirty Hydro Flasks? Probably not but maybe? Now, I’m sure that waiting a couple days between washing will be ok but I will definitely change my routine. It is not the water that your filling your bottle with- it is the fact that your putting it to your mouth. Germs develop in moist environments and can multiply quickly. Not washing your water bottle gives germs a chance to grow regardless if your using plastic, glass, metal, or ceramic. Cleaning your water bottle doesn’t mean just rinsing it out with water. Soap with hot water and a good scrub should do the job! Click here to check out a cool scrub brush set I found on Amazon. You can clean the straws and lid with it too. Studies found that 60% of the germs found on water bottles are the kind that can make you sick! In addition the average water bottle has about 313,499 CFU (or colony-forming units of bacteria) compared to 2,937 CFU on a pet’s chew toy, according to a recent TreadmillReviews.ca study. Whew! I’m going to go clean all the water bottles in our house. Great information. In the midst of flu and apparently measles season this is so timely. If you can get the bottle washed daily try having a second lid/straw. The you just have to change out the cap. Great idea! I’m going to get extra lids.